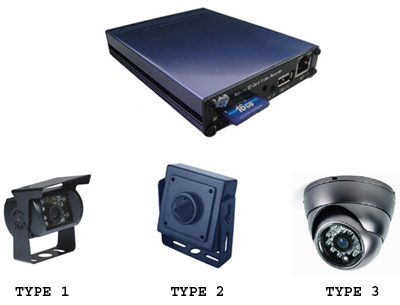 See More CCTV Packages Here This package combines a high quality H.264 SD Card vehicle DVR with either indoor or outdoor vehicle camera(s) to match the number of channels. This High quality H.264 Compression Vehicle DVR is a rugged and compact 1, 2 or 4 channel solid state video/audio recorder that is capable of taking the bumps and jars of emergency vehicles use, also ideal for taxis, bus and commercial vehicle use and other demanding mobile and remote applications, it records directly to high capacity SD cards, and can record 1 audio channel and up to 4 video cameras. Complete with alarm inputs, network connection, USB port,PTZ and GPS capability this compact small DVR has everything required, easily swap out memory cards for download using a computer, or play video back directly to any video device right from the recorder. Integrates easily into your driver's routine, when the shift is over, employees turn in their keys, paperwork and memory card, containing a perfect record of the shift, preserved on solid state media for download and archiving for Liability protection, security, and employee action monitoring all in one. Includes infrared remote control as well as mounting brackets and all required A/V and power cables. A copy of the English user manual is available on request. Video Input: 4 channels / 2 channels / 1 channel, 1.0Vp-p,75 ohm,BNC. Video Out: 1 channel, 1.0Vp-p,75 ohm,CVBS or LCD. Audio Input: 2 channels(Stereo),Line In,50~400mv,50Hz~3500Hz. Max Resolution: PAL 720�~576 / NTSC�F720�~480. Working Condition: Temperature: 0~+50, Humidity: <90%. Please be sure to indicate in the payment notes which camera(s) your require, you may mix camera types, the colour of the indoor infrared dome camera (TYPE 3) may vary from the colour shown in the picture.